Hi everyone. Today I'm sharing a zig watercoloured image x 2. I made these a few months back, but haven't had time to share them on my blog until now. This is a beautiful stamp from STAMPlorations. 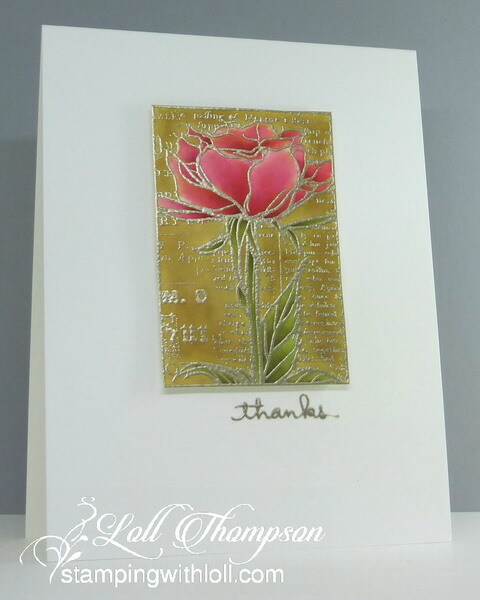 I heat embossed the image in gold, watercoloured the rose and left the text background white. I fussy-cut around the frame and popped up the image panel for added dimension. The rose really pops off the background. I made a second card using the same image. This time heat embossing in liquid platinum and watercolouring the rose in shades of red. My set of 48 zigs doesn't have a real red colour. The two red markers come out pink when water is added, so I watercoloured the rose first in the red (pink) and then added a layer of brown on top and I really like the colour it ended up being. 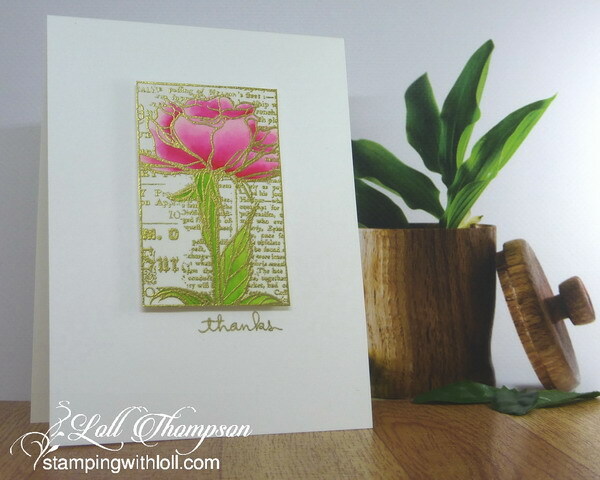 I filled in the background this time with a medium brown which gives the card a vintage feel. Both are beautiful, but I really like the vintage look of the second one! Good job on adding enough brown to get the "red" Zigs to come out red! You are right Loll, this stamp is beautiful, but it depends on the creator whether the card will be just beautiful or stunning. Your cards, in particular the second card is stunning! I love the dark background for a rose and the look of its petals. They look like velvet, and I almost feel them under your fingers a velvety touch. It is a wonderful impression, because to make the image give a feeling of touch is a real miracle. I love this card. This is so pretty. I don't use my Zigs enough. Nice reminder of how vibrant they are. I don't comment enough here but I bookmark a lot. WOW! That stamp is just beautiful and your water coloring just blew me away on this! Your gorgeous water coloring skill are just amazing! Love the red you managed with the zigs. Kind of frustrating to not get red but I've found that with most markers as well as some paints. That color with brown added is incredibly beautiful. Now I may have to have this stamp! Both are gorgeous, Loll.! Love them. Enjoy your day! Gorgeous heat embossed and Zig coloring on both your rose images, Loll. I love how you added a brown tone to your pinkish red on the 2nd card. It now looks much redder. In the past, I have just added several layers of the red, which does help cover the pink tones. I really like the rich color better adding your brown. Your coloring the background on your 2nd rose really made your rose pop. You are making me want to get my rose out and playing. TFS Hugs..
Two beautiful twofers.. Love the look of the second vintage card, especially how you achieved the truer red colour. What wonderful cards Loll - especially the second one - that is stunning and quite dramatic with the deep colour of the rise and the 'antiqued' background. Beautiful work, Loll! Both flowers are so striking and visually appealing. You are a truly wonderful artist. I really like the vintage feel of the second card. Thank you so much for sharing! Hope you have a great day! So pretty with the white background and the gold embossing! Very elegant! Thanks for the tip of adding brown over the pink to make it more reddish! and I love the colored background! Two very different looks to the same stamp! It's always amazing to see how different a stamp can look like when you change the colors! The first one is so fresh, it reminds me of spring! And the second one looks more vintage, as you said, or even fallish! I have heard that the red Zigs are pinkish and love how you solved that problem! Gorgeous cards! I love the gold embossing. Wow! Thanks, you enabler...is that a word? :-) Love both of these cards. Both your cards are beautiful Loll. I recognized the stamp as soon as I saw it. They are lovely little sets.